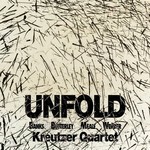 Unfold / Banks, Butterley, Meale, Werder ; performed by Kreutzer Quartet. String quartet / Don Banks. Commission note: Commissioned by Musica Viva Australia for performance by Austral String Quartet.